Pulitzer Prizes Are Out: 'Washington Post,' 'The Guardian' Win For NSA Stories : The Two-Way Months after exposing the National Security Agency's surveillance program, The Washington Post and The Guardian win a Pulitzer for public service. Donna Tartt won for fiction with The Goldfinch. Journalists Laura Poitras and Glenn Greenwald helped The Guardian win a Pulitzer Prize for public service along with The Washington Post Monday, for their stories based on NSA documents provided by Edward Snowden. Months after lifting a veil of secrecy from the National Security Agency's surveillance operations, The Washington Post and The Guardian won a Pulitzer Prize for public service Monday. The two papers broke the story in tandem, relying on NSA documents provided by Edward Snowden. 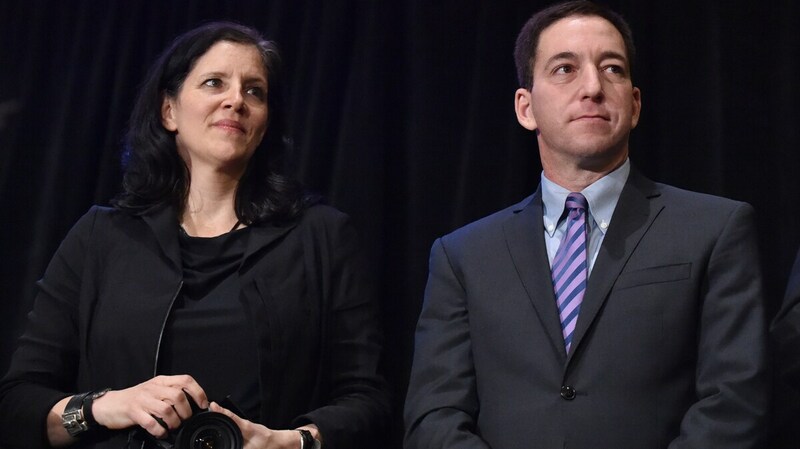 The Pulitzer Prize win comes days after two journalists at the heart of the story, Glenn Greenwald and Laura Poitras, received a George Polk Award for national security reporting. On that occasion, Greenwald said, "I hope that as journalists we realize not only the importance of defending our own rights, but also those of our sources like Edward Snowden." But the Polk award rankled some, including Rep. Peter King, R-N.Y., who called Greenwald "a disgrace." He added, "No American should give Glenn Greenwald an award for anything." The staff of The Boston Globe won the Pulitzer for breaking news reporting, for what the Pulitzer panel called "its exhaustive and empathetic coverage of the Boston Marathon bombings and the ensuing manhunt that enveloped the city, using photography and a range of digital tools to capture the full impact of the tragedy." The Pulitzer winners were announced Monday at Columbia University in New York City. We'll fill in this post with more details about the winners this afternoon. In the writing and music categories, Donna Tartt's novel The Goldfinch won the fiction prize. The history prize went to The Internal Enemy: Slavery and War in Virginia, 1772-1832 by Alan Taylor. Investigative Reporting: Chris Hamby of The Center for Public Integrity, Washington, D.C. See related NPR story. Fiction: The Goldfinch by Donna Tartt (Little, Brown) See NPR's archive. History: The Internal Enemy: Slavery and War in Virginia, 1772-1832 by Alan Taylor (W.W. Norton) See NPR's archive. General Nonfiction: Toms River: A Story of Science and Salvation by Dan Fagin (Bantam Books) See NPR's archive. Music: Become Ocean by John Luther Adams (Taiga Press/Theodore Front Musical Literature) See NPR's archive.